Dataset is one of the new technology in ASP.NET and it maps the entire database in iteself which means it can have all the Tables, Columns, Relationship, Constraints etc. Having all these in Dataset, it makes itself a disconnected database in which you can make changes and later you can update against actual database. In other words we can say that Dataset is a mirror copy tables and being disconnected in nature it makes insert/update/delete operations much faster. I assume you are aware of other ADO.NET components such as Connection, Command, DataAdapter etc..
Typed Datasets are Tightly coupled datased which provides Type-Safe operation where fields of tables are mapped as property. Uptyped dataset are one which we create programatically and its loosely coupled. Typed dataset reduces overhead and increases performance as they already have table schema with them. Any type mismatch can be captured at compile time instead of run-time. One disadvantage with Typed Dataset is if your table schema changes, you need to everytime change the Dataset's XSD file (which i will discuss later). To start creating Typed Dataset demo, I will be using Northwind Database. If you dont have this DB, you can download from MS Site. This will help us to be on same page and later you can try with your own database. 1. 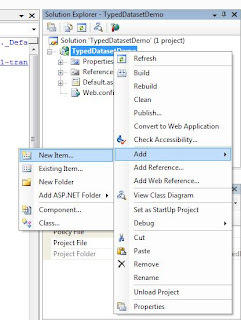 Start Visual Studio 2005 and create "New Project" and select "Web Application" and name the project as "TypedDatasetDemo". Reason for Web App is because you can see the code generated by visual studio. Same steps are applicable for WebSite too. 2. In "Solution Explorer", right click and select "Add New Item". 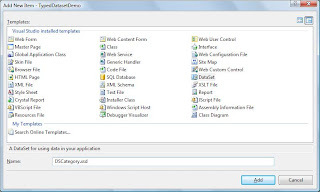 Select Dataset from Dialog and name as "DSCategory.xsd". 5. Leave with default selection of "Use SQL Statement" and click Next. 6. Paste the query in SQL Statement text area. "SELECT CategoryID, CategoryName, Description FROM Categories". You can even use "Query Builder..." button to create query by wizard. 7. 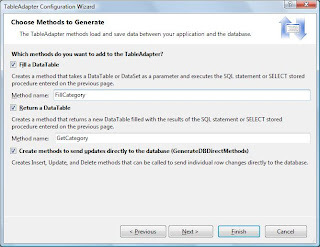 In next screen, you need to mention the method name to "Fill a DataTable" and "Return a Data Table". This method will be used to fill DataTable and will be bound to control e.g. Grid View. Change the method name to "FillCategory" and "GetCategory". 8. Click "Finish" to complete the wizard. Thats it... Typed dataset is created which can be used by web pages. To complete this demo, we will create WebPage and load data into Grid View. Open Web Page and drop "Grid View" and name as "gvCategory"
Switch to "Code View" of page and copy the code as mentioned below.